Cloudy with a Chance of Meatballs TV show on Cartoon Network (image via DHX Media). You may have seen a meteor shower, but you’ve never seen a shower “meatier” than this. The Cloudy with a Chance of Meatballs TV show is slated to premiere on Cartoon Network in the US and Teletoon in Canada, in 2017. The 2D animated TV series will air on Turner channels in European, Middle Eastern, African, Asian-Pacific, and Latin American markets. The Cloudy with a Chance of Meatballs TV series, based on the Sony Pictures Animation feature film franchise, is produced in partnership with DHX Media and commissioned by Teletoon in Canada. The first season consists of 26 half-hour episodes and is set, “…before giant food came raining down on Swallow Falls.” Featured characters include: Flint Lockwood, Sam Sparks, Tim Lockwood, Steve the Monkey, Manny, Earl, Brent, and Mayor Shelbourne. DHX Media, a key player internationally in the creation of content for families and children, is developing and producing twenty-six 22-minute, traditionally animated small-screen episodes of Sony Pictures Animation’s blockbuster film franchise. Internationally, Cloudy with a Chance of Meatballs: The Series will air on Turner Broadcasting’s Boomerang and is set to debut in Fall 2017. What do you think? 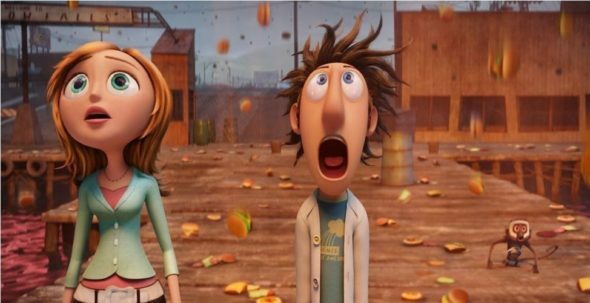 Do you like the sound of the Cloudy with a Chance of Meatballs TV series? Will you check it out, when it premieres? More about: Cartoon Network TV shows: canceled or renewed?, Cloudy with a Chance of Meatballs, Cloudy with a Chance of Meatballs: canceled or renewed? Uncle Grandpa was great, people like you just think anything absurdist is bad. oh no… this is going to happen. Isn’t it?